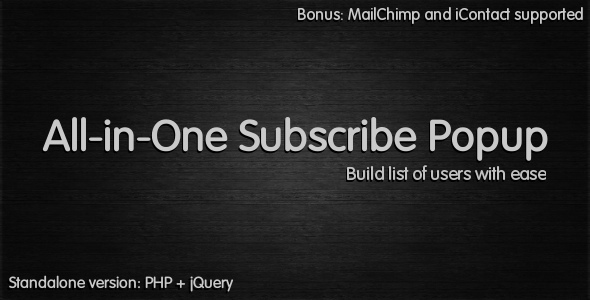 All-in-One Subscribe Popup is a PHP +jQuery script that allows you to add a highly customizable subscribe popup box to any website. It combines 7 different popups (on page load, on external link click, on copy content, on context menu, on scroll down, on idle, on click), which can be used separetely or simultaneously without conflicts. Once raised, popup asks visitors to submit their name and e-mail. These data are saved in database or submitted to MailChimp and iContact newsletter systems. All saved data can be exported as CSV -file to be used with any other newsletter systems. Integration of the script is really simple. All you need to do is to add single line of code into your website. - Modern Opt-in form: popup box contains HTML5 +CSS3 AJAX -ed opt-in form. - Highly customizable: set size, colors, opacity, background image and even edit CSS . - Modern popup box: shadows, round corners, etc. - Secure Admin Panel: configure script and manage data through nice admin panel. - Content editor: insert any HTML -content inside of popup box. - MailChimp supported: contact details can be submitted to MailChimp through their API . - iContact supported: contact details can be submitted to iContact through their API . - CSV Export: all data can be exported as CSV -file to be used with any newsletter systems. - 7 subscribe popups in one plugin: use them separetely or simultaneously without conflicts. - OnPageLoad popup appears once user open page in browser. - OnClickExternalLink popup appears once user click any external link on page. - OnCopyContent popup appears once user copy part of your page into clipboard (using Ctrl+C or through context menu). - OnScrollDown popup appears once user scroll down current page to particular point. - OnIdle popup appears after defined period of inactivity. - OnContextMenu popup appears once user call context menu (click right mouse button). - OnClick popup appears once user click on link with class="megasubscribepopup_click" attribute. - Remember visitors: OnPageLoad and OnScrollDown popups can be displayed only once per visit. - OnPageLoad autoopen and autoclose delay: you can configure these parameters too. - Remember subscribed visitors: script remembers users who already subscribed the page (using cookie). - Show or hide close button: open popup box as modal window. Click “Live Preview” or visit demo website . There you can see all subscribe popups (on page load, on external link click, on copy content, on context menu, on scroll down, on idle, on click). - When you open demo website , you will see OnPageLoad popup. - Then you can click external link #1 or external link #2 under “Demo” section and you will see OnClickExternalLink popup. - Try to copy any part of content into clipboard and you will see OnCopyContent popup. - Scroll down this page and you will see OnScrollDown popup. - Do not touch mouse, keyboard or screen for 30 seconds and you will see OnIdle popup. - Click right mouse button and you will see OnContextMenu popup. - At the end you can click another demo link under “Demo” section and see OnClick popup. You can try admin panel. Let’s imagine that you have website http://www.website.com/ and you want to install there. - Edit inc/config.php and set MySQL database parameters. - Go to admin panel http://www.website.com/subscribe-popup/ using default login/password (login: admin , password: admin ) and configure script on Settings page. - Make sure that your website loads jQuery. If it doesn’t, just add this line into head section. - Add this piece of code at the bottom of the page (before </body> tag). Universal Banner Manager; Universal Digital Shop; Universal Donation Box; All-in-One Subscribe Popup; Donation Content Locker; Subscribe to Unlock Content; All-in-One Subscribe Popup. Keywords: contact, e-mail, email, icontact, list, mail, mailchimp, newsletter, pop, popup, subscribe. Premium CodeCanyon All-in-One Subscribe Popup 2902529 WordPress Themes, Website Templates, Mobile Themes, Flash Templates & Scripts from creative professional designers. Full details of CodeCanyon All-in-One Subscribe Popup 2902529 for digital design and education. CodeCanyon All-in-One Subscribe Popup 2902529 desigen style information or anything related.